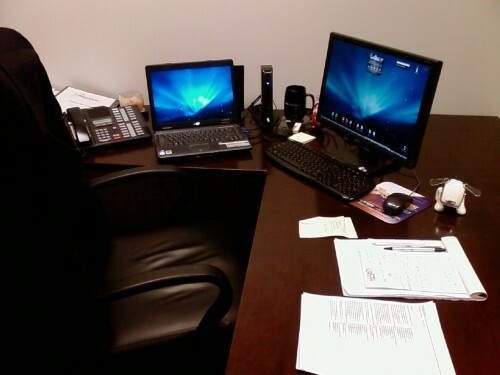 5 Easy Tips for a Better Workspace | It's not your tech, it's how you use it. If you’re setting up a new workspace at home from scratch, moving to a new desk at the office, or even just pondering giving your workstation a makeover and maybe giving your working routine a breath of fresh air, this week I want to may out some tips and tricks that can help you do it. Being classy is more than just looking good to outward appearances, it’s about your gear looking good to yourself, it’s about feeling good in your clothes and feeling good at your desk when you set down to do some work that you feel really good about doing. So let’s take a look at some suggestions – with the help of a few off-site friends – of how you can make sure your desk and workspace really meshes with the kind of work you do and the way you prefer to work. Hopefully by the time we’re finished this week you’ll be ready to take a few hours to clean off your desk and set it up in a manner that works better for you, run out and pick up a new desk that works better for you, or at the very least rearrange a few critical items on your desk to help you work more effectively. 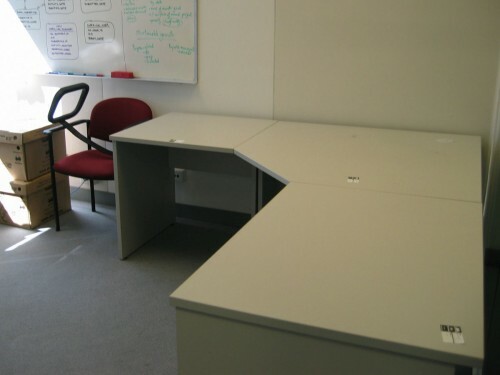 I know, I know, if you work at an office with cubicles or fixed office furniture, you don’t really have the luxury of going out and buying a new desk, and in some cases you don’t even have the cheap air max luxury of changing around the arrangement of furniture or where you’re seated at your desk. For some people, when they start a job, someone comes and puts their computer where they think it would logically fit, they set it up, and that’s your desk arrangement. But have heart! There are ways to beat that racket too, with a little planning and organization. 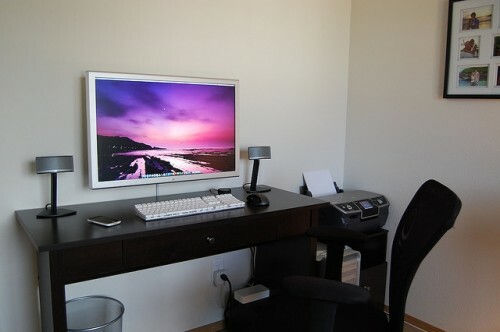 First though, let’s take a look at some desks and desk setups that may work best for you at home, or in a place where you have a bit more control over the way your workspace or home office is set up. First and foremost, if you have the luxury of setting up a workspace from scratch or being willing to trash your existing desk or workspace for a new one, you’ll want to make sure you get the right stuff to make you happy while you work. So the questions then become, “how do you want to work? where do you want to sit?” Over at Unplggd there’s an excellent list of pros and cons to different desk types and orientations, and while virtually every layout has its pros, there are cons to all of them that might drive you crazy if they’re not for you. For example, I’m a huge fan of corner desks and L-shaped desks, but mostly because I feel they give you the most amount of space in a workspace that in many cases can be a cramped area in an apartment or home that’s been re-purposed from its original intended use. A dining room with desks in it, for one, or a second bedroom turned into a home office. What’s best for me though may not be best for you – maybe you don’t like having your back to a door, like you may with a corner desk. Maybe you prefer an “over the desk” approach when someone walks into your office or workspace, where you can look up and see who they are instantly. Perhaps your room is long and narrow, and a wall-desk is the only arrangement you could make work. Take into account the dimensions of your workspace and the amount of physical square footage you have to work with along with the way you naturally work. If you tend to move things from one side of a desk to another in an almost assembly-line fashion, you may want a long, straight desk instead of a two-part desk with shelving on the wall and a flat work surface behind it. Maybe you have three or four monitors, or multiple computers you’d like spread out in front of you – you may want an U-shaped desk instead. All of these examples are important to illustrate that there are three major factors to consider when picking your desk hardware: the space you intend to put the desk in, the equipment you plan to put on that desk, and the way you use that equipment to get work done. As long as you’re thinking of these three things and not necessarily about what’s the shiniest or what you’ve seen in a photograph somewhere, you’ll do just fine. Now that you have a desk selected, it’s time to hone in on the thought process you were likely in the middle of when you were selecting the desk to buy (at least I hope you were:) how you’re going to use the equipment you have for your desk. I’m going to go ahead and assume that even if you have the budget for a shiny new desk to use to revamp your workspace, you probably don’t have the budget for new computers, monitors, or other peripherals. If you do, good on ya, Daddy Warbucks, and I strongly advise you take a little time and money and use it to replace some of the gear on your desk that doesn’t work for you with things that will. Do you have a choice of where to sit or where your gear goes? If so, where do you WANT to sit? Where are your power outlets/power strips/Internet or network cables? Where are you most likely to greet visitors to your workspace? Where do your papers/tasks/work items tend to collect now? Do you want to keep them there? If not, where should they go? Once you have some answers to these questions, you’ll be all but ready to decide where your gear rests – some things you’ll be able to compensate for – like getting a power strip with a long cable if your outlets are on the wrong end of the desk, or a longer network cable if your jack is on the left side of the desk and you want to be on the right. Make sure to position your gear best for your personal workflow and your privacy – if people come up to your desk on one side, put your gear there so you can look up at them instead of worrying someone is behind you all of the time. If people tend to drop work off for you there, put your computer and in-box there so there’s a place for that work to go naturally without you having to move it yourself. Then you can reach in, grab a task or organize it quickly, and get to work without having to do more work just to get to work. Follow? When placing your gear, especially your electronic gear, on your workspace, think again about where you’re sitting and in what kind of seat. You don’t need to run out and buy a Herman Miller Aeron chair or a fancy ergonomic keyboard (although if you have the money to do so, they’re great investments and very comfortable) to focus on the basics. You know, monitor at eye level so you’re not slouching to look at your display or craning your neck upwards to see your screen. 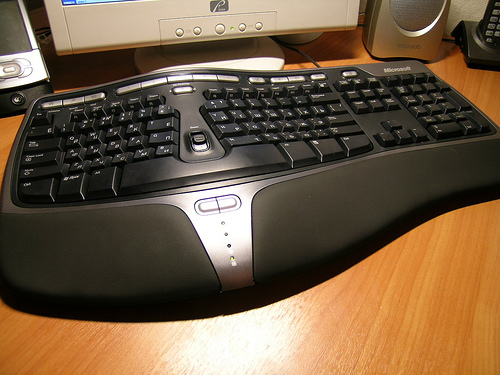 Keyboard and mouse at arm level, 90-degrees to the plane of your body. Try to keep your multiple displays (if you have them) in the same field of view so you don’t twist your head to look at your primary or secondary display. Some people love keyboard trays and other people hate them – some offices have them and others don’t (or can’t, based on the furniture.) Personally? I hate them, but I know enough people who swear by them that I won’t make a judgement call here – it’s entirely up to you whether you should use one or not, but the important thing is to make sure your wrists stay as natural and as straight as possible when typing and you’re not stressing your wrists or arms just to write e-mail or use your mouse. There are tons of great guides on how to set up your workspace ergonomically, and take them all with a grain of common sense when applying them to your own workspace. Don’t blow your budget when raising your chair will do, or install a keyboard tray when you don’t have a desk that will support one. Worst case scenario, there are people willing to help you set up a more ergonomic workspace, and some of them may even work in your office and may be willing to give you tips on your home office as well. Don’t underestimate the importance of ergonomics here, seriously – there’s a lot of foo-foo medicing around some aspects of it, sure, but there’s a lot of hard medicine and real scientific data around the study as well, and RSI (Repetitive Stress Injury) is nothing to laugh at or overlook. A few minor changes can mean the cheap nike trainersdifference between wearing a wrist brace or getting up from your computer with tired eyes and pain in your neck every night and not noticing the hours whiling away while you work at your computer. This last tip is for the folks who, at the beginning of the piece, thought to themselves that they had a little money to spend not just on a new desk, but also on some new equipment for that desk. Sure, you can run out to Staples or Target and pick up some letter organizers or in/out boxes for your paper work, or even a new ergonomic keyboard or laptop stand for your desk, those are great ways with minimal budget to improve your workspace. At the same time though, now that you’ve picked the right desk for you, put your stuff on it in a way that makes sense for your workflow and your personal comfort, and you’ve made sure your workspace is as ergonomic and comfortable as possible, now you have the opportunity to use it for a while and consider possible improvements. Do you have enough desk space for your papers? Maybe a monitor stand that you can slide items under, or a VESA mount for your displays bolted to the back of your desk would free up the footprint by your monitors. Maybe you didn’t think you needed a new keyboard or mouse, but now that you’re much more comfortable you could go for one. Maybe the optimal spot for your computer and writing a part of the desk with little light, so a lamp is in order. Think about ways to keep improving on your situation to make your desk the best possible workspace you can, and you’ll find yourself happy to return to it day after day. So far we’ve discussed workspace options as though you have free reign over where you put your items, how they’re arranged, and what type of desk you have. You likely work in an office with a pretty rigid workplace environment: your computer goes here, your keyboard goes there, your chair goes there, welcome aboard. You have control. Even if you have little to no influence over your workspace, you have control. Seriously, let that sink in and feel empowered by it. Whether it’s just a matter of raising or lowering your seat, you’ve got something – do whatever you can to be comfortable, and find creative ways to make it so that you are. Even if you’re penned into a tiny 2-foot wide desk barely large enough for your monitor and your keyboard and a tiny little non-adjustable chair, you’ve got to do something with that space. Grab a few books and put them under the monitor if it’s too low, work with the keyboard on your lap if the cable will reach. Did your office issue you a laptop? See if you have a wireless network at the office and go work somewhere a little more comfortable. Don’t take your workspace lying down: assert your discomfort (within limits, I mean. No manager likes a whiner, especially if your manager is in the same cramped conditions. Call centers, I’m looking at you.) and brainstorm with your manager or colleagues about what you can do within reason, workplace policy, or even budget to be a little more comfortable. 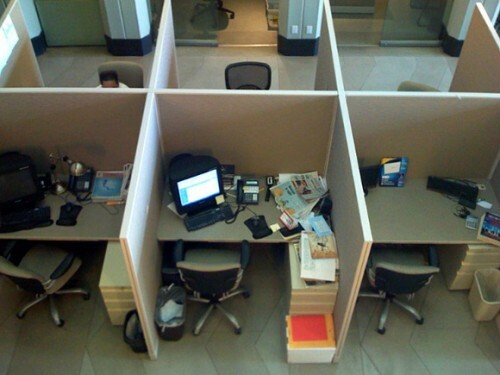 I’m not promising this will work everywhere – some offices herd their employees in like cattle – most people, small space. Space is expensive, don’t spend more on space than you have to. I follow. Some workspaces are just uncomfortable, and there’s very little you’ll be able to do about it short of leaving, but frankly, you won’t know until you feel empowered enough to try something. Hello readers. Look at your workspace. Now look at the winners of our Workspace Photo Contest. Now back at your workspace. Now over to Lifehacker’s Featured Workspace posts. Sadly, your workspace likely isn’t any of those those places, but they could be, and hopefully I’ve just told you how. Go forth and make changes! Oh, and when you do? I’ll expect you to enter our next workspace photo contest. After all, you’ll have me to thank, right? For me having a computer monitor that takes advantage of an IPS panel is crucial. I do a lot of video/photo editing and graphics design, as a result having accurate colors is critical. Not to mention the viewing angles of IPS panels are much wider. My partner uses a TN monitor and you are unable to even movie your head without the hues changing. With any luck OLED displays will come shortly. OLED will even make IPS panels seem poor.